Tidbury Green is a small settlement in the south western corner of the Metropolitan Borough of Solihull within the Blythe Ward. Prior to the 1930’s Tidbury Green was a rural area comprising a number of farms centred on crossroads that provided passage to south Birmingham, Earslwood and Grimes Hill from south Warwickshire. 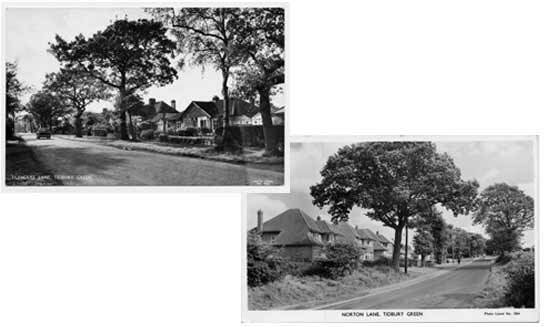 In the 1930’s major development took place and much of the housing in Fulford Hall Road, Tilehouse Lane, Lowbrook Lane and Norton Lane was built. This development continued spasmodically to the 1990’s through infilling along Norton Lane and Fulford Hall Road. Since that date development has been very limited as Solihull Council policy sought to protect the rural nature of the area. Government policy in late 1990’s encouraged the use of existing sites for development which has made Tidbury Green a target for developers due to the relatively large plot sizes on which dwellings stand. Tidbury is the highest part of the Borough reaching 505ft (sorry, 154 metres) which is why snow seems to last longer here. You could say that the rest of Solihull look up to us! Those of you who have bent your spades and garden forks digging in the garden can blame the last Ice Age which finished a mere 10,000 years ago. A huge ice sheet centred over North Wales deposited a thick layer of boulder clay over Tidbury Green. Boulder clay as the name suggests is a mixture of stones, boulders and clay. If you keep on digging you will eventually come to Keuper Marl which is the main underlying rock. Tidbury Green School was opened in 1931 and offered education for 100 pupils. In early 1982 the parish was offering financial support for a campaign to keep the school open. In 1987 the Council agreed to fund its redevelopment and Ken Meeson said “There is a great deal of local concern about the future of the school. I urged strongly that the council should show good faith to local wishes by giving an assurance about the future of the school and come out clearly with a commitment to rebuild it.” The Council agreed to fund a £430,000 development at the school. Soon after this go ahead was given a detailed structural survey indicated that the school was in a far worse state than had been expected and rebuilding was being discussed. By the end of 1989 a deal was being discussed in which Hockley Heath Parish Council (HHPC) would provide 3 acres of their land on which to build the new school and a new village hall and special recreation facilities. This new school was to be a two form entry and ultimately to have 500 pupils. HHPC was very supportive of the whole programme having not only provided the land but also offering up to £20K to support the Village Hall. A year later in June 1991 the plans were shelved as the Council received insufficient Government funds and it was not until 1994 that work began and the new school finally opened in 1995. Part of the delay was blamed in 1992 on the new 700 home village in nearby Dickens Heath that was to be built on Green Belt land.